The major earthwork at Fort Hill is an ancient earthen-walled enclosure constructed on top of a large flat-topped ridge. The earthen-stone wall has a circumference over one and a half miles, its span interrupted with at 36 definite made-man openings, and three more possible man-made openings. The wall itself ranges from 6 to 15 feet in height, averages 30 feet wide at its base, and encloses 35.3 acres. It was built to follow the natural contour of the rim of the hill, and is bordered on the inside wall by a substantial ditch. The total length of the embankment has been surveyed at 8,619 feet. It is conjectured that Fort Hill was most likely not a fort at all, but a ceremonial gathering space. Archaeological evidence suggests that the earthwork was built approximately 2000 years ago by people belonging to what is often referred to as the Hopewell Culture, an epithet derived from the surname of the European owner of an early excavation site in Chillicothe, Ohio. What name these Native Americans called themselves, and in what language they spoke, has unfortunately been lost to the mists of time. The Hopewell Culture is associated with nearly a dozen mysterious hilltop enclosures in southern Ohio. 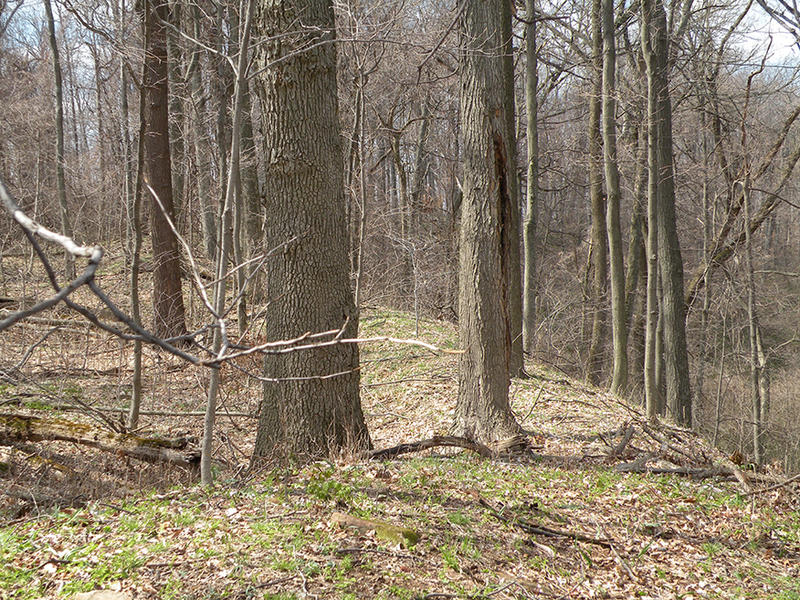 The Fort Hill Earthwork can be accessed by following the Fort Trail, which follows the perimeter of the enclosure. Fort Hill’s dramatic ridge top enclosure has become synonymous with the park’s cultural importance. However, a second extremely well-preserved earthwork exists on the south side of the property, composed of a circular walled enclosure with a diameter of approximately 170 feet and a height of 2.5 to 3 feet. Archaeologists have discovered two concentric circles of post holes directly beneath the earthworks, but no supporting posts in the middle of the enclosure. The original structure may have looked more like a fenced wall or an arbor than a roofed building. Because a Hopewell-era bladelet was found in the circular mound, it is presumed that this structure is roughly 2000 years old. Also discovered in the vicinity by archaeological researchers was a second post structure, this time rectangular in shape and including central support posts. Artifacts recovered from this site included Indiana flint chips, worked mica sheets, and one piece of obsidian blade – all indicating Hopewell-era construction. It is conjectured that this large structure, 180 feet by 60 feet, may have been an artisan workshop or short-term habitation site for visitors to the Fort Hill ceremonial complex. This structure is not visible today to human eyes, but is an extremely important archaeological site for unraveling the history of Fort Hill. To reach the circle mound, take the Fort Trail from the parking lot, and follow it to the Gorge Trail at the south side of the park. Turn left on the Buckeye Trail. When the Buckeye Trail leaves the forest and traverses a grass meadow, look for the raised rim of the circle mound on your right (see trail map). It is not always easy to see, especially if the grass has not been recently mowed. You are permitted to cross the field to this site. However, if you continue south on the Buckeye Trail you will soon leave the park’s boundaries. Please stay on the trail after that point so that you do not trespass on private lands. The Hopewell Culture is actually best known – not for its hilltop earthworks – but for immense geometric earthwork complexes built upon Ohio’s floodplains in the shape of precise circles, squares and octagons. Often these enclosures encircled a number of burial and ceremonial mounds. Over two dozen major geometrical floodplain complexes were documented by early archaeologists in central and southern Ohio – and, enigmatically, no where else in the Hopewell Culture region of North America. Tragically, none of the complexes are fully intact today. Much of the Hopewell Culture’s grand earthen architecture was built on rich floodplains destined to become Ohio’s most productive farm fields. Consequently most of the complexes have been flatted by the plow and now lie under fields of soybeans and corn. 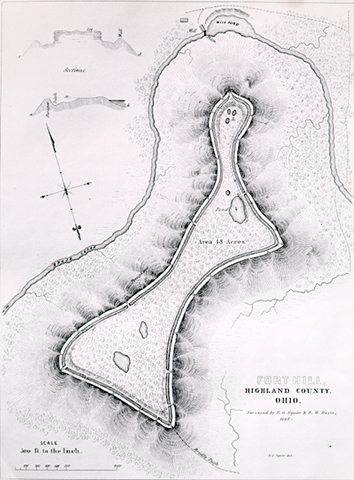 Other complexes were dozed and covered by the foundations of several of Ohio’s early founding cities, including Circleville, Portsmouth, and Chillicothe. The creative artifacts and earthworks of the Hopewell Culture are considered by many archaeologists to exemplify the highest fluorescence of Native American art on the continent, and the inspired expression of one of the largest, most influential cultures ever to exist in temperate North America. Judging from the wealth of recovered art, the watersheds of Paint Creek and the Scioto River (a few miles northeast of Fort Hill) appear to have been the cultural epicenter for the far-flung Hopewell Culture. It was in this region that most of the nearly two dozen large geometric earthwork complexes that were engineered by the Hopewell Culture were located.